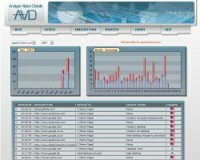 Track Web Site Visitors free with AVD is an online stats program to provide you with a free and up to date facilty to track web site visitors. With AVD you can analysis of all the visitors that have viewed your site. To use this service you will need a web hosting package and add two lines of html code to each page on your site that you want to track. This service is completely free of charge. The details stored are : The visitors ip, location, browser (e.g internet explorer / firefox), operating system (e.g windows / mac), screen resolution and the users current language setting. Domains can be added and removed simply by using the control panel provided with your account. All statistics are presented in a clean and easy to understand format. The signup process is very straight forward and can be completed in seconds, you will find the form here > sign up. Select a screenshot to view full size. You can swap between domain names within your account easily from any page in the control panel. Your registered account details and the currently selected site are also shown on the main page. On the 'details' page you can modify your account details and also remove any sites you no longer wish to track visits for. All stored records for any site that has been removed are deleted from our database permanently. You can also request a deletion by email to our support group. The 'Webstats' page provides you with a clean and easy to follow break down of all your visits. The graph on the top left shows unique and return hits on a monthly basis. Once a month is selected the graph to the right is populated with daily unique and return hits for that month. The lower section of the 'Webstats' page displays all the individual hits and some basic information about the visitor (in order) How many hits received, Time of the initial visit, where the visitor found your site, which page they landed on, any search terms that were used to find your site and the country the visitor originated from. The 'Advanced' section of the webstats page presents you with detailed information on your visitors; namely : Ip address, the visitors location, how many times the visitor has viewed your site this month / day, language the visitor is using, operating system, screen resolution and the browser being used. It also shows you a list of pages hit by the visitor so as you can track where the visitor went to on your site and also if they left using any external links or downloaded any documents or images from your site.